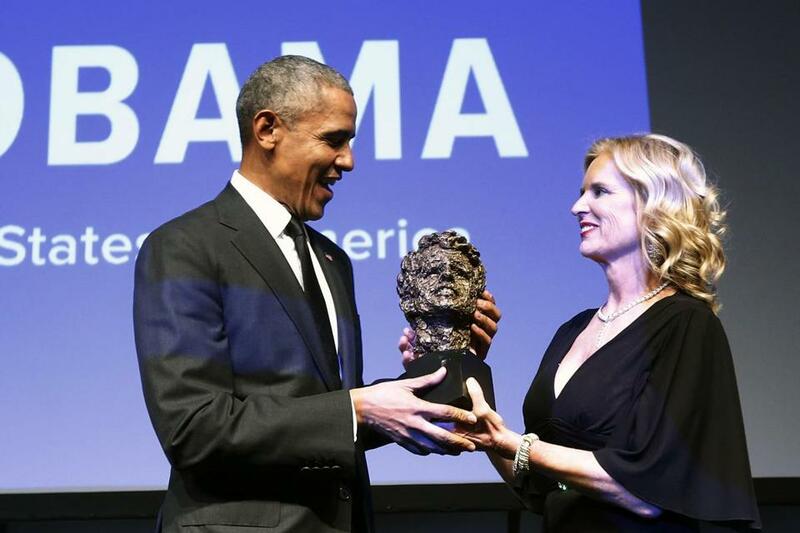 Kerry Kennedy, president of Robert F. Kennedy Human Rights organization, presented former President Barack Obama with the foundation&apos;s Ripple of Hope Award at a ceremony in New York. NEW YORK — Former President Barack Obama was honored with the Robert F. Kennedy Human Rights Ripple of Hope Award at a gala in midtown Manhattan Wednesday evening. ‘‘I’m not sure if you’ve heard, but I’ve been on this hope kick for a while now. Even ran a couple of campaigns on it. Thank you for officially validating my hope credentials,’’ Obama said during his remarks. The organization’s president, Kerry Kennedy, presented the award, which celebrates leaders ‘‘who have demonstrated a commitment to social change.’’ Past recipients include Bill Clinton, Hillary Clinton, Al Gore, Bono, George Clooney, and Robert De Niro. ‘‘If we summon our best selves, we can inspire others to do the same. It’s easy to succumb to cynicism, the notion that hope is a fool’s game,’’ Obama said. Also honored with Ripple of Hope Awards were New Jersey Governor Phil Murphy, Discovery President and CEO David Zaslav, and Humana CEO Bruce Broussard. Speakers included actors Alec Baldwin, Keegan-Michael Key, Alfre Woodard, and journalist Tom Brokaw. This year also marks the 50th anniversary of Robert F. Kennedy’s campaign for the White House.